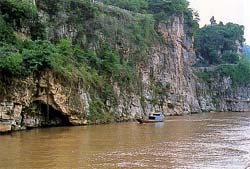 Yichang sits at the division of the upper and middle reaches of the Yangtze River in west Hubei. It covers 21,084 sq. km. with a population of 3.89 million. The temperature averages 16-18°c. Yichang is adjacent to the Three Gorges to the west and has long been a distribution center of goods and a transportation hub. It is also a place connecting the cultures of Ba in the west (an ancient state in the eastern part of what is now Sichuan Province) and Chu in the east ( an ancient state in what is now Hubei and northern Hunan provinces). It is inhabited by Tujia ethnic group.